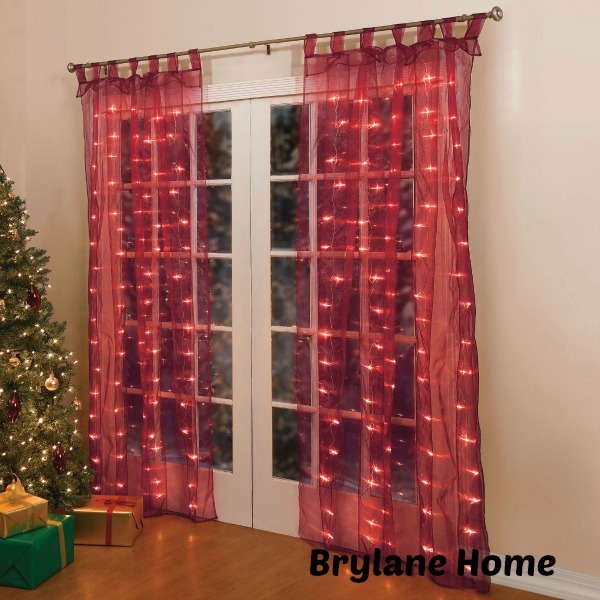 Brylane Homes Pre-Lit Curtain Panels Are The Perfect Decor This Holiday! I recently had the chance in reviewing Brylane Homes Pre-Lit Curtain Panels. Brylane Home was created 1998 to make it easy for it’s costumers to decorate your home with today’s latest styles, colors, and designs. They give the best prices every day of the year, you won’t have to wait for a sale when you shop with Brylane Home. Brylane Home is known as “America’s White Sale Catalog”, it is filled with everything from fashion bedding and home accents to housewares and bath shop items. They have also added window treatmens, slipcovers, floor covering, vacuum, sewing, cleaning and ironing to mix to make your home shopping experience better. I received the Pre-Lit Curtain Panel in burgundy, and it also comes in white. With these curtains you can illuminate any room in your home with its lighted screen window panels. It’s simple, just plug them in and watch it glow. With festive cheer radiating from your windows and the smell of Christmas in the air let BrylaneHome guide your way tonight. These curtains are for indoor use only and come with a 10″ cord. The dimensions are: 84″H x 54″W. Not only will these curtains make for the perfect decor this holiday season, but they would also make for a nice gift for teens. I feel teens would really enjoy something like this in their room. Skip the fairy lights and buy the whole curtain that lights up!